The labour market continued to improve in the third quarter of this year, but several indicators show that hiring may be slowing amid global uncertainties. Between July and September, more people were employed here and fewer lost their jobs, compared with the preceding three months. Official figures released yesterday by the Ministry of Manpower (MOM) showed that total employment, excluding foreign domestic workers, grew by 16,700 from July to September. This was the fastest rate in four years, surpassing even the preliminary estimates of 15,200 released in October. Observers said this is likely driven by good economic growth in the first half of the year. Also, while there were more than enough vacancies for jobseekers in the third quarter, the surplus dipped. The seasonally adjusted ratio of vacancies to unemployed people was 1.05 in September, down from 1.1 in June. This was due to an increase in the overall number of unemployed people and a slight decline in the total vacancies for the whole economy, MOM said in its report. Analysts said these figures are worth watching, as businesses turn cautious amid the riskier external environment. "They are very driven by what is in the headlines regarding the world market, especially on the China-United States trade relations front," said CIMB Private Banking economist Song Seng Wun. He added that while there may be more hiring of workers during the current festive season, it will be clearer how many are really needed after Chinese New Year. MOM also cautioned that the hiring momentum "may moderate against a backdrop of external trade tensions and slowing growth in Singapore's key final demand markets". On the bright side, higher-skilled sectors saw good employment growth. These included professional services, information and communications, financial and insurance services, and community, social and personal services. In all, there were 3,446,300 people working in Singapore in September, excluding foreign domestic workers. 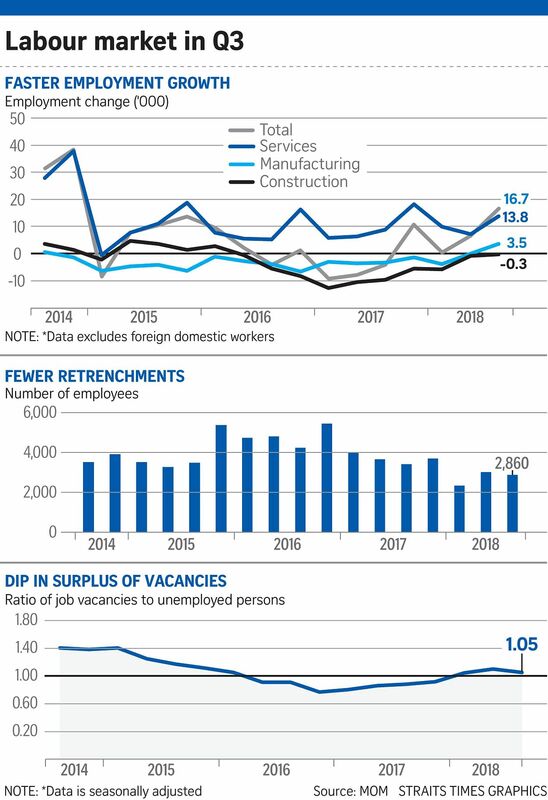 Unemployment remained low, at 3 per cent for Singaporeans, while the rate for residents - Singaporeans and permanent residents - also held steady at 2.9 per cent. However, overall unemployment rose to 2.1 per cent in September, up from 2 per cent in June. The long-term unemployment rate for residents went down to 0.6 per cent in September from 0.7 per cent in June, after taking seasonal variations into account. This rate measures the share of jobless residents in the labour force who have sought work for at least 25 weeks. They are very driven by what is in the headlines regarding the world market, especially on the China-United States trade relations front. MR SONG SENG WUN, an economist at CIMB Private Banking, on how businesses may be affected by uncertainties. One worrying trend is that professionals, managers, executives and technicians account for a disproportionately large number of the workers getting retrenched, said DBS economist Irvin Seah. He said these workers are relatively more vulnerable despite their higher qualifications and skill sets. "It is important for policymakers to focus on this segment of the labour force as it is more difficult for them to re-enter and find new jobs." MOM said workers and businesses should stay agile and responsive to market demands, given the ongoing economic restructuring and the mismatch between jobs available and skills held by workers. Job opportunities remain available in sectors such as information and communications, financial and insurance services, healthcare, professional services, wholesale trade and the built environment, it said.